I grew up on a farm in Northern Indiana. I milked cows, tended beef cattle, rode horses, raised baby pigs that my Dad would have otherwise killed, played with ducks, rabbits, dogs, cats, and the occasional wild animal, helped my Mother garden, and did a lot of cleaning and cooking in addition to living with 6 other people in our house; 1 sister, 3 brothers and Mom and Dad. I have loved animals for ever and frequently played with my pets more than my friends. Participation in the local 4H program provided opportunities to learn about a wide variety of topics. I loved to learn and still do. 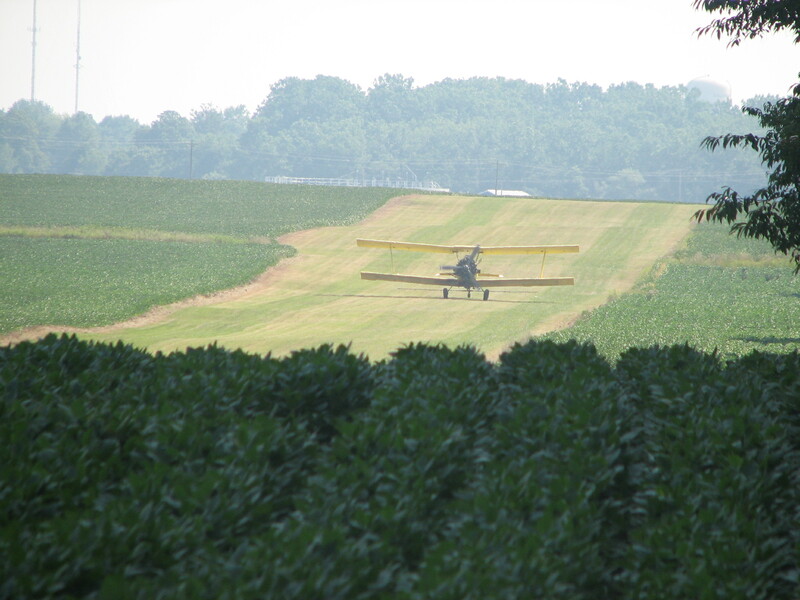 Crop dusting plane landing on the air strip on our family farm. My parents attitudes along with our home life instilled in me an appreciation for nature, animals, and self-sufficiency. Farm life develops a strong work ethic and it was this very trait that earned me my first job as a registered veterinary technician in 1978. I have a huge garden and grow much of the food our family consumes in both winter and summer; as I preserve the bounty by canning, freezing, and dehydrating. I raise goats and chickens, make goat milk soap and other body products like massage oil, body salts/scrubs, lotions and lip balms. I sew, make candles, and all sorts of crafts as time allows or need demands. I look for ways to use all the goat milk I get each season and am trying my hand at making mozzarella, ricotta, and feta cheese this season. Creativity is the fuel that rekindles my spirit and I am always looking to learn how to do something I know nothing about. I have been a music teacher for 20 years and think of it as a vocation. I love to teach others about things I have passion for. I am a born nurturer and think of my students as “my kids” no matter their age. This blog is an attempt to extend my classroom to those having an interest to learn new things and try their hands at providing things for themselves. Glad I found out how to subscribe to your web sight. It is great. Please keep us informed on how to follow your projects. I really enjoyed the soap you gave us at the AP reading – is there any way I can order more from you? Aaron I am so glad you enjoyed the soap. Hope the rest of the summer was great for you and the family. By the way, I am moving forward with my agritourism idea and hope to be accepting visitors to the farm within the next year. I will let you know when I have things in place in case you still want to make a visit to experience farm life. I have a few varieties of soap to select from and two purchase options Aaron. I opened a shop on Etsy.com (lifesimplepleasure) and you can make a purchase through the site. I also have olive oil and goat milk soap with a light fragrance in 3-4 oz bars OR lard, tallow, and palm oil with goat milk soap with a very light fragrance. I charge $4 dollars per bar and shipping is usually $4.95 (shipping multiple bars). Thank you for the follow up and I look forward to hearing from you soon. So glad you found joy in this post. Come back and check out my fall walk posts for pictures from my property located in Southeast Indiana. Thanks for sarhing. What a pleasure to read! I like your website artwork. I can’t master Photoshop at all. I don’t have photoshop but I do have a Mac and iphoto has a few editing features. There is an online photo editing site called picnik that might be of use to you. We are a group of volunteers and starting a new initiative in our neighborhood. Your blog provided us with valuable information to work on|.You have done a marvellous job! This makes me really happy! Thank you for sharing. Hope I can be of help in the future. Wonderful facts thankfulness for expressing. In actual fact in all of content of this site there is always things to educate yourself on. So glad you found something of value and for letting me know you found the sight. I have been reading out some of your posts and i must say pretty clever stuff. I will surely bookmark your site. Thank you! I appreciate your support. Sorry, but I debate with this blog post. I actually do really enjoy your specific blog page still and will continue to keep moving once again for upgrades. Thank you for sharing! So glad you enjoy the page enough to come back again. Why does this have to be the ONLY reliable suorce? Oh well, gj! Glad you found my blog helpful! I’m sure there are other good sites out there; but I’m glad you found mine. Thanks for sharing. I am still learning about ZUmba but so far I enjoy what I see! Hi Liz: It has been fun reading about the life you and Ruffles have built on the farm. We would enjoy coming down to visit you this year if possible. Where does the 1/4 amish come from…your dad or mom? Great to hear from you Dawn! It would be fun to get together and catch up. Quarter Amish comes from my son-in-law. He came up with the name for my blog because my life style shares many of the characteristics of the Amish. I believe in self sufficiency, raise most of the vegetables we eat, value my livestock and believe the simple pleasures in life are the best! I also have relied heavily on Amish cookbooks to feed my family for the past 30 years and Trevor always enjoys my meals. Glad you stopped by the site and I hope you visit again. Thank you! I have spent a life time learning a variety of things that proved themselves valuable. I don’t intend to stop learning new things anytime soon. Thanks for sending your comments and I hope to hear from you again. Visiting this site truly made me to discover something todays morning. Thank you a lot for giving out this info. Thank you Amber for visiting and leaving a comment! How did you find my webpage? Very intreresting blog. It was very useful. I was searching exaxtly for this. Thank you for your effort. I hope you will write more such useful posts. Glad I could be of help! Keep checking in…I’ll post more. Sorry, but I debate with this unique post. I actually do take pleasure in your particular blog page though and may continue to keep coming once more for update versions. Thank you! Hope to hear from you again. Very useful blog. It was very useful. I was searching exaxtly for this. Thank you for your effort. I hope you will write more such useful posts. Very useful blog. It was very useful. I was looking exaxtly for this. Thank you for your effort. I hope you will write more such useful posts. Very useful post. It was very relavant. I was looking exaxtly for this. Thank you for your effort. I hope you will write more such useful posts. Of the panoply of webstie I’ve pored over this has the most veracity. Very useful blog. It was very relavant. I was looking exaxtly for this. Thank you for your effort. I hope you will write more such interesting posts. Very useful blog. It was very relavant. I was looking exaxtly for this. Thank you for your effort. I hope you will write more such useful posts. Very intreresting blog. It was very useful. I was searching exaxtly for this. Thank you for your effort. I hope you will write more such interesting posts. Very intreresting post. It was very useful. I was looking exaxtly for this. Thank you for your effort. I hope you will write more such interesting posts. Stellar work there everyone. I’ll keep on redaing. I´ve really enjoy reading this post. You use a lot of effort to writting it and that´s cool! Cheers! Very intreresting post. It was very useful. I was searching exaxtly for this. Thank you for your effort. I hope you will write more such interesting posts. Thank you for stopping by and sharing your thoughts….Come back again. Very useful post. It was very useful. I was searching exaxtly for this. Thank you for your effort. I hope you will write more such useful posts. Very intreresting post. It was very relavant. I was searching exaxtly for this. Thank you for your effort. I hope you will write more such interesting posts. I create a comment when I appreciate a post on a blog or if I have something to add to the conversation. It is triggered by the fire communicated in the post I browsed. And on this post About | Quarter Amish. I was actually excited enough to drop a thought 🙂 I do have 2 questions for you if you tend not to mind. Could it be only me or do a few of these responses come across as if they are written by brain dead visitors? 😛 And, if you are writing at additional places, I’d like to keep up with everything fresh you have to post. Would you make a list all of your communal pages like your Facebook page, twitter feed, or linkedin profile? Thank you for the words of encouragement. Many of my blog visitors are from a variety of foreign countries. I think the language barrier and limitations of translating programs affects the content of the comments. It could be an “English as a second language” class working to improve their skills. Irregardless, I am happy to have folks drop by and leave a message. At this time, I post regularly only on this blog…..Maybe I will expand my world in the future, but for now this keeps me busy. Thank you for stopping by and leaving a note! Thank you for letting me know you are having issues with the rss! I will check into it to see if I can make it easier. Did you try the subscribe link or just the rss? Thanks! Very useful post. It was very relavant. I was searching exaxtly for this. Thank you for your effort. I hope you will write more such useful posts. thanks for your thoughts on this, I felt a bit struck by this article. Thanks again! We’ve go through some great information right here. Definitely worth bookmarking for returning to. I wonder the amount effort you’d put to create this sort of wonderful beneficial web-site. Thank you. It has taken a life-time to gather the knowledge shared in this blog. It only takes hours to put that knowledge into words. Both have been well worth the time it took! Thanks a lot for giving this info. Very useful and also interesting. Enjoyed examining this, very good stuff, thanks . “To be positive To be mistaken at the top of one’s voice.” by Ambrose Bierce. Most treatments skin products aim to make nutrients to skin tissues, thus allowing them to heal after there’s also been damage, and replacing most of the moisture and fat which were lost. This is my third time to your article, I love it every time! I completely go along with everything you mentioned in this blog post. Thanks for the fascinating info. Excellent post.. I had to check it twice to comprehend it all though, haha! Your blog is the best I have seen for a long time! I was checking out this website and found this good post today. I found you via google. Great post! Wammy, am I ever thrilled I arrived to your blog. Great details! Witty! I’m social bookmarking anyone website for future use. Having read this I thought it was very informative. I appreciate you finding the time and effort to put this content together. I once again find myself spending a significant amount of time both reading and posting comments. But so what, it was still worth it! Nice writing in About | Quarter Amish. I loved reading this. If you like, please visit my website. I’m good at speaking my mind, but not so good at expressing my thoughts in written words. You are good at writing as proven through reading your article. I enjoyed reading your very informative article. Thanks for your kind words…..I try to post about once a week but my day job keeps me too busy during February and March. Hopefully I’ll be back on schedule at once a week soon. Awesome site! Where did you get that awesome layout? Thank you! I have a family member “in the business” so to speak. He set the page up for me, and I just add the content and graphics. Highly interesting blog. You often publish a intriguing article. Thanks! Allow me to say how much I appreciate your kind words. I hope that someday soon this blog takes off! Nice blog! How did you get this layout? I have a son-in-law that is a computer engineer. He created the great layout. All I have to do is add my images and blog updates. I am impressed with this web site , very I am a fan . I rarely drop comments, but i did some searching and wound up here About | Quarter Amish. And I do have 2 questions for you if it’s allright. Could it be just me or does it look like a few of the responses appear as if they are written by brain dead individuals? 😛 And, if you are posting on other sites, I’d like to keep up with everything fresh you have to post. Would you list of all of your communal sites like your Facebook page, twitter feed, or linkedin profile? I realize several of the comments I get are a bit atypical. I know many of my blog readers come from countries where English is not spoken, so I am sure they are either using translators or trying their best to use English properly. I am glad they leave a comment even if it doesn’t translate perfectly. Thank you for your interest. I have an Etsy Shop and do link it to Facebook; it is listed as Quarter Amish by Life Simple Pleasure. I have not utilized Linkedin yet for business purposes. Maybe I should be? I precisely needed to appreciate you all over again. I am not sure the things I would’ve gone through without the actual recommendations documented by you over such a concern. Previously it was a very distressing concern in my view, but discovering the well-written strategy you treated it forced me to cry over joy. I’m happier for the support and thus hope you comprehend what a powerful job your are providing instructing men and women using a site. I am sure you haven’t got to know all of us. Youre so cool! I dont suppose Ive learn something like this before. So nice to search out anyone with some authentic ideas on this subject. realy thank you for beginning this up. this web site is something that’s needed on the net, somebody with a bit of originality. useful job for bringing something new to the web! Everything is very open with a very clear clarification of the challenges. It was definitely informative. Your website is useful. Thanks for sharing! I am not sure the key reason why however this excellent website is launching incredibly gradual for me. Is anyone else possessing dilemma or possibly this a challenge on my own conclusion? I am going to check back afterwards if ever the dilemma nevertheless is out there. Recently i came across your website and possess been looking through combined. I thought I’d leave my very first opinion About | Quarter Amish. I don’t know very well what to state apart from I have savored perusing. Decent website. I’ll keep touring this blog frequently. Thanks for conveying. Keep publishing similar to this. My brother recommended I may perhaps like this weblog. He was fully ideal. This post realistically prepared my day. You’ll be able to not contemplate just what amount time I had invested for this info! Thank you! Wonderful post! We will be linking to this great article on our site. Keep up the great writing. Fascinating article – cheers. You consistently write a intriguing blog post. Kudos again – I will come back. Wow that was unusual. I just wrote an incredibly long comment but after I clicked submit my comment didn’t appear. Grrrr… well I’m not writing all that over again. Anyhow, just wanted to say excellent blog! Thank you for commenting! I review all comments prior to them being published….sorry for the frustration, but I want to make sure that inappropriate comments cannot be posted on my blog. Youre so cool! I dont suppose Ive learn anything like this before. So good to seek out anyone with some authentic thoughts on this subject. realy thank you for starting this up. this web site is one thing that’s wanted on the internet, someone with a bit of originality. useful job for bringing something new to the web! What kind of posts are you looking for? This is such an ideal resource that you are providing and also you give it away for free. I love seeing websites that perceive the worth of providing a top quality useful resource for free. Great job! I am commenting to make you understand what a amazing experience my friend’s child went through reading your webblog. She realized so many details, with the inclusion of what it’s like to have an excellent teaching mood to let a number of people clearly fully understand a number of impossible subject areas. You really exceeded her expectations. I appreciate you for supplying those invaluable, trustworthy, revealing and as well as unique tips on the topic to Gloria. Thank you for sharing this story! I am thrilled that a child enjoyed learning on my site. Highly entertaining blog post. You consistently write a riveting blog post. Thanks! I blog frequently and I really appreciate your content. Your article has really peaked my interest. I am going to take a note of your site and keep checking for new details about once a week. I opted in for your Feed as well. Hello! This is my 1st comment here so I just wanted to give a quick shout out and say I truly enjoy reading through your blog posts. Can you recommend any other blogs/websites/forums that deal with the same subjects? Appreciate it! Hello i am so delighted I found your blog, I in fact discovered you by error, while I was searching Yahoo for a bit else, Anyways I’m at this juncture now and would just similar to speak thanks for a superb net site posting along with a all round absorbing site (I additionally adore the theme/plan), I don’t have time to examine it all at the correct now but I’ve bookmarked it and in addition added your RSS feeds, so when I have time I’ll be back to examine additional..
Can I just say what a aid to find someone who really is aware of what theyre talking about on the internet. You positively know how you can deliver an issue to light and make it important. Extra people have to learn this and perceive this aspect of the story. I cant consider youre no more standard because you definitely have the gift. That is really attention-grabbing, You are a very professional blogger. I’ve joined your feed and look forward to in search of more of your magnificent post. Also, I have shared your website in my social networks! I was very happy to find this web-site.I needed to thanks for your time for this glorious read!! I undoubtedly having fun with each little bit of it and I’ve you bookmarked to take a look at new stuff you weblog post. I think other web-site proprietors should take this web site as an model, very clean and excellent user genial style and design, as well as the info about diabetes. You’re an expert in this kind of topic! It’s a privilege to read quality content in this day and time. Your article has the qualities I have grown to expect from real writing. Wow, what a quality it is! For the reason that mostly YouTube video tutorials have no pleasant quality, however this is really a pleasant quality video. This will be a excellent site, could you be involved in doing an interview regarding just how you developed it? If so e-mail me! Hey there you really ought to do this while its still hot! I think other website proprietors should take this internet site as an example , very clean and great user pleasant pattern . “No act of kindness, no matter how small, is ever wasted.” by Aesop. Hi there, Thanks a lot for this wonderful post! I will certainly save About | Quarter Amish. Cheers. My brother suggested I would possibly such as this website. He was 100 % best suited. This publish actually produced my day. You can actually not picture just just how much time I’d spent for this info! Thank you! I am glad for being one in all a great number of customers on this spectacular internet site (:, thank you for putting up. Great website you have right here but I was curious about in the event you knew of any discussion boards that cover the same topics discussed here? I’d truly like to be a part of community where I can get advice from other experienced people that share the same interest. In case you have any suggestions, please let me know. Kudos! fantastic points altogether, you simply gained a brand new reader. What would you suggest about your post that you made a few days ago? Any positive? Uncovered your short article extremely remarkable in truth. I definitely appreciated studying it and you simply make really some great factors. I will bookmark this website for your upcoming! Relly great short article. Hey there, thanks for revealing your ideas in About | Quarter Amish. This is actually an awesome blog. Audio started playing anytime I opened up this web site, so irritating! I don’t have any audio connected to this website….check your end. Great job for the Post! It’s a picture I took myself…. I’ve recently started a website, the information you offer on this site has helped me tremendously. Thank you for all of your time & work. About | Quarter Amish Very nice post. I just stumbled upon your weblog and wanted to say that I’ve truly enjoyed browsing your blog posts. After all I will be subscribing to your rss feed and I hope you write again soon! I have been checking out some of your stories and i can claim clever stuff. I will make sure to bookmark your site. My son-in-law actually set the features of the site for me; however, I created my own theme from a picture I took myself. Good luck on your venture…..
About | Quarter Amish Very nice post. I just stumbled upon your blog and wanted to say that I have truly enjoyed surfing around your blog posts. After all I will be subscribing to your feed and I hope you write again very soon! About | Quarter Amish Pretty nice post. I just stumbled upon your weblog and wished to say that I’ve truly enjoyed browsing your blog posts. After all I’ll be subscribing to your feed and I hope you write again very soon! Well this kind of information is really worth searching for, very great information for readers and a value for you as will definitely show the quality of the writer. I am looking to get a competent author, extended time in this area. Excellent article! Appreciate it for this post, I am a big big fan of this site would like to continue updated. I conceive this internet site has got very good composed content articles . I just want to mention I am just beginner to blogs and actually savored you’re blog. Probably I’m planning to bookmark your site . You definitely come with fabulous articles. Thanks a lot for sharing with us your blog. Nice post at About | Quarter Amish. I was checking continuously this blog and I’m impressed! Very helpful info particularly the last part 🙂 I care for such info much. I was seeking this particular info for a long time. Thank you and good luck. About | Quarter Amish Pretty nice post. I just stumbled upon your weblog and wanted to say that I’ve truly enjoyed browsing your blog posts. In any case I will be subscribing to your rss feed and I hope you write again soon! I just want to tell you that I am very new to weblog and really liked your blog. Very likely I’m likely to bookmark your site . You absolutely come with exceptional articles and reviews. Cheers for sharing your website. About | Quarter Amish Pretty nice post. I just stumbled upon your weblog and wanted to say that I have really enjoyed browsing your blog posts. After all I’ll be subscribing to your feed and I hope you write again soon! I stumbled on your own internet site by incident as looking Yahoo and I am glad I did. Your publish is definitely a little bit unique and I appreciated reading through it. I’ll in turn create a comment about it on my blog site and level my customers your way. Thanks. I am glad to be a visitor of this everlasting blog ! , enjoy it for your details! . Excellent post at About | Quarter Amish. I was checking constantly this blog and I’m impressed! Very helpful information specially the last part 🙂 I care for such info a lot. I was looking for this particular info for a long time. Thank you and best of luck. I would like to show my appreciation for your kindness for women who actually need help on this concern. Your personal dedication to passing the message all-around ended up being incredibly helpful and has really encouraged regular people just like me to achieve their ambitions. This invaluable useful information signifies a lot a person like me and especially to my office colleagues. Regards; from all of us. I and my friends have already been studying the good advice found on your site and then the sudden I had a horrible suspicion I never thanked the site owner for those techniques. Most of the ladies were excited to learn all of them and already have really been tapping into these things. Thanks for actually being well considerate and then for getting certain nice themes most people are really wanting to understand about. Our own honest regret for not expressing gratitude to you earlier. About | Quarter Amish Very nice post. I just stumbled upon your blog and wished to say that I have really enjoyed surfing around your blog posts. In any case I’ll be subscribing to your feed and I hope you write again very soon! you’re in reality a just right webmaster. The web site loading speed is amazing. It sort of feels that you’re doing any distinctive trick. Moreover, The contents are masterwork. you’ve done a great task in this matter! The first time in several months that I have clicked on “I’m Feeling Lucky” and actually got an informative Web site. Thankyou. I added this post to my favorites and plan to return to digest much more soon. It is straightforward to read and understand as well as intelligent. I truly enjoyed my first read through of this article. Thank you Olga for your kind comments. The theme is my own…. Keep up the superb work , I read few articles on this website and I believe that your site is very interesting and holds circles of great information. The notion you shared about vegetable salads are great plus the content of your post is filled with substance and as a reader I’m actually grateful that there are a great deal people today who works hard on their writings before posting it. I believe this website has got very fantastic written subject matter articles. I have identified your write-up quite informative and fascinating. I appreciate your points of view and I agree with so numerous. You’ve done a fantastic job with creating this clear enough for anyone to comprehend. Wow, amazing blog format! How lengthy have you been running a weblog for? you made blogging glance easy. The total look of your web site is magnificent, as neatly as the content material! hi!,I love your writing so so much! share we keep up a correspondence extra about your post on AOL? I require an expert in this space to resolve my problem. Maybe that is you! Having a look ahead to peer you. Thank you for another informative website. Where else could I get that kind of info written in such a perfect way? I have a project that I’m just now working on, and I’ve been on the look out for such information. Thanks for each of your effort on this web site. My aunt really loves making time for internet research and it’s really simple to grasp why. A lot of people learn all relating to the powerful tactic you make informative steps via this website and as well as increase response from website visitors about this topic so our own daughter is starting to learn so much. Enjoy the rest of the year. You are always carrying out a powerful job. I should admit that your post is really fascinating. I have spent a lot of my spare time reading your content material. Thank you a whole lot! I actually wanted to compose a quick message to appreciate you for these precious solutions you are placing at this site. My time intensive internet investigation has at the end of the day been honored with useful facts and strategies to go over with my friends. I would assert that most of us visitors are definitely endowed to exist in a decent site with many awesome professionals with beneficial solutions. I feel somewhat blessed to have encountered your web site and look forward to many more entertaining times reading here. Thanks a lot again for a lot of things. I have to convey my appreciation for your generosity in support of visitors who need guidance on this one matter. Your real commitment to passing the solution along had been rather functional and have regularly made professionals just like me to achieve their endeavors. Your personal important tutorial means much to me and a whole lot more to my office workers. Thank you; from everyone of us. My wife and i ended up being now thankful when Peter managed to complete his reports using the precious recommendations he had while using the weblog. It’s not at all simplistic just to choose to be handing out information which some other people may have been making money from. And we also do know we have the writer to give thanks to for that. The main illustrations you’ve made, the simple blog menu, the friendships your site help engender – it is everything terrific, and it’s really letting our son and the family know that that theme is pleasurable, which is certainly especially mandatory. Thanks for all! whoah this blog is great i love reading your posts. Keep up the good work! You know, lots of people are hunting around for this information, you could help them greatly. I am commenting to let you know of the outstanding discovery my wife’s daughter encountered studying your blog. She learned some details, with the inclusion of what it’s like to have a marvelous giving style to have most people with no trouble know various impossible subject matter. You undoubtedly surpassed her expected results. Thank you for coming up with these beneficial, safe, explanatory and also easy tips on the topic to Mary. I am commenting to make you know what a nice encounter my child found checking the blog. She came to understand plenty of things, with the inclusion of what it’s like to have an amazing helping nature to make folks clearly understand specific tortuous matters. You actually exceeded our expected results. Thank you for coming up with those insightful, trustworthy, educational and also easy guidance on this topic to Emily. salutations from across the sea. informative post I shall return for more. Feel free to link my site to yours. I enjoy you because of all of your effort on this blog. My mother take interest in managing internet research and it is obvious why. Almost all notice all relating to the lively means you provide good things through your blog and inspire participation from some others on the area then my simple princess is actually being taught a great deal. Take pleasure in the remaining portion of the year. You are always performing a fantastic job. Of course, what a splendid blog and instructive posts, I definitely will bookmark your site.Best Regards! Its great as your other blog posts : D, appreciate it for posting . “It takes less time to do things right than to explain why you did it wrong.” by Henry Wadsworth Longfellow. Effectively I truly liked studying it. This subject procured by you is very useful for proper planning. It’s appropriate time to make some plans for the future and it’s time to be happy. I have read this post and if I could I wish to suggest you some interesting things or advice. Perhaps you could write next articles referring to this article. I desire to read even more things about it! What topic or topics did you have in mind? I truly enjoy studying on this web site, it has superb content. “The living is a species of the dead and not a very attractive one.” by Friedrich Wilhelm Nietzsche. I would take it as a compliment if you use a portion of the post. Would you mind giving me credit? Thank you. Thank you for all of your efforts on this site. Kim takes pleasure in getting into investigations and it’s simple to grasp why. Most of us notice all concerning the lively form you make powerful tricks by means of the blog and as well as boost response from website visitors about this concern plus our favorite child is always starting to learn a whole lot. Enjoy the rest of the new year. Your conducting a great job. My husband and i got satisfied Albert managed to round up his studies through the entire precious recommendations he acquired in your blog. It is now and again perplexing to just be making a gift of secrets which other people could have been selling. We really do understand we need the writer to be grateful to because of that. The most important explanations you’ve made, the simple web site navigation, the relationships you will help to foster – it’s got everything terrific, and it is letting our son and the family know that this subject is satisfying, and that is seriously mandatory. Thank you for the whole lot! Outstanding post, I conceive people should acquire a lot from this website its real user genial. So much superb info on here :D.
Hi there! This post couldn’t be written any better! Reading through this post reminds me of my good old room mate! He always kept chatting about this. I will forward this post to him. Pretty sure he will have a good read. Thanks for sharing! I like the valuable information you provide in your articles. I’ll bookmark your blog and check again here regularly. I am quite sure I will learn lots of new stuff right here! Best of luck for the next! I don’t ordinarily comment but I gotta admit regards for the post on this one : D.
Have you ever thought about writing an ebook or guest authoring on other blogs? I have a blog centered on the same ideas you discuss and would really like to have you share some stories/information. I know my visitors would appreciate your work. If you’re even remotely interested, feel free to shoot me an e-mail. I intended to send you the little note so as to give thanks the moment again for these incredible thoughts you have discussed on this site. It was quite remarkably generous with you to supply openly just what many of us would’ve supplied for an electronic book to generate some money for themselves, mostly considering that you might have done it if you wanted. The tactics likewise served to become a easy way to understand that other individuals have similar interest much like my personal own to figure out a good deal more pertaining to this problem. I know there are thousands of more fun moments ahead for individuals that looked at your blog post. I truly enjoy examining on this internet site, it holds good articles. “Beware lest in your anxiety to avoid war you obtain a master.” by Demosthenes. I happen to be commenting to let you know what a excellent experience our girl went through browsing the blog. She came to understand too many pieces, which included what it is like to have an incredible giving nature to have a number of people just gain knowledge of specific hard to do subject matter. You actually exceeded our desires. Thanks for distributing the insightful, dependable, explanatory and even fun tips on your topic to Julie. My partner and i still cannot quite believe I could become one of those studying the important ideas found on your web site. My family and I are really thankful on your generosity and for offering me the advantage to pursue my personal chosen career path. Thank you for the important information I acquired from your website. Hello! I’ve been reading your web site for some time now and finally got the courage to go ahead and give you a shout out from Humble Tx! Just wanted to say keep up the fantastic job! I have to express my admiration for your kind-heartedness in support of people that should have guidance on this important subject. Your very own dedication to passing the message across has been pretty insightful and have always encouraged men and women like me to reach their ambitions. Your new warm and friendly guideline signifies so much to me and further more to my peers. Thank you; from each one of us.